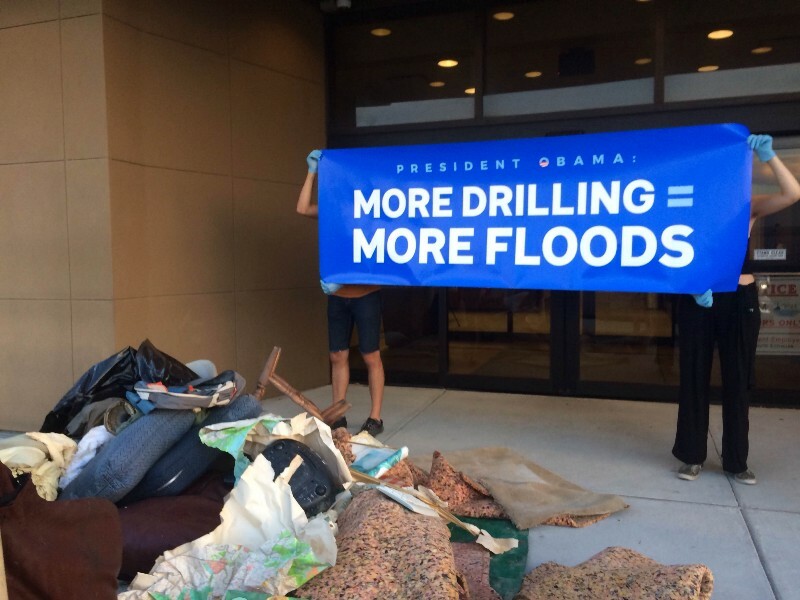 Four people were arrested for trespassing at the New Orleans office of the Bureau of Ocean Energy Management (BOEM) on Tuesday, after they delivered a petition with nearly 200,000 signatures calling for President Obama to cancel plans to lease off parts of the Gulf of Mexico for oil and gas development. “We tied the recent flooding to the effects of climate change and the ongoing drilling in the Gulf,” said one of the arrested activists, retired teacher Ranate Heurich, 61. BOEM auctioned more than 138,000 acres of the Gulf to oil developers Wednesday. In total, in this one auction, the federal government put 23 million acres of the Gulf up for sale. Louisiana, while being an oil and gas producer, is also at the front lines of climate change. The low-lying and sensitive coastal areas are at risk from rising sea levels and increasingly intense storm systems. The recent storm that flooded Baton Rouge was at the scale of what has previously been known as a 500-year storm — but was the United States’ eighth 500-year flood in the past 12 months. Thirteen people died, 60,000 homes were damaged, and thousands were evacuated in this most recent tragedy. The people of Louisiana are beginning to fight back. The protesters asked President Obama, who was in Louisiana on Tuesday to address the Baton Rouge flooding, to cancel the sale. Obama did not respond to the petition, nor did he mention climate change in his public remarks. Originally, the agency planned to hold the auction at the Superdome, which famously served as a refugee center for New Orleans residents displaced from Hurricane Katrina devastation 11 years ago. BOEM instead opted to conduct an online auction for the leases. BOEM officials did not respond to repeated requests for comment. Heurich said the police officers were “courteous” and that she and her two New Orleans-based companions were released with a summons about 20 minutes after being taken to the local jail. The fourth protester, a California resident, was released later in the afternoon. Anne Rolfes, a community organizer with the Louisiana Bucket Brigade who helped organize this week’s activities, said that the public plays a key role in stopping continued oil and gas extraction. 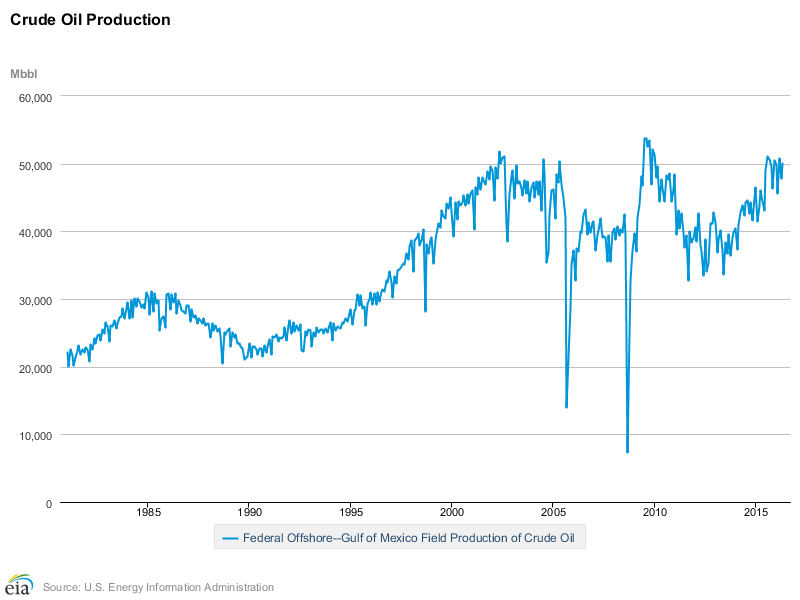 The Gulf of Mexico contains one of the largest oil reserves in the United States, and 17 percent of the country’s oil extraction comes from federally leased offshore areas, according to the federal Energy Information Administration. BOEM has approved hundreds of exploration and drilling permits in the Gulf, even since the BP Deepwater Horizon disaster drew the nation’s attention to the risks oil extraction. This, all while the country pledges to move away from fossil fuel development. During Obama’s tenure, BOEM proposed and then removed Atlantic drilling from the agency’s five-year plan. Environmental advocates credit a widespread public outcry along the Atlantic coast for encouraging the administration to give up those plans. In South Carolina, for instance, every shoreline community passed a resolution against drilling, seismic testing (a disruptive pre-extraction activity), or both. Prior to delivering the signed petition, the groups deposited a pick-up truck worth of debris from the Baton Rouge flooding to BOEM’s doorstep. Meanwhile, the American Petroleum Institute (API) touts the economic benefits of oil and gas drilling in the Gulf. According to the Gulf Restoration Network, there are near-constant oil spills in the Gulf. “Almost every time that we fly over the coast and the Gulf we see leaks and spills occurring, mostly related to oil and gas infrastructure,” executive director Raleigh Hoke told ThinkProgress last month. In addition, the oil and gas industry is responsible for between a third and nine-tenths of Louisiana’s coastal land loss. Dredging accounts for much of this loss. The industry is fighting efforts by local and state government to hold it accountable for environmental damage along the coast.